I'm glad to be back creating! We've had some crud running through our house over the weekend, so I took some time off. Thankfully after some meds, everyone's feeling a bit better! Trying to keep one step ahead this week, I created today's card for MJ's TechnoStamper Sketch Challenge 103. First I cut the smaller circle from Basic Grey Scarlet t's Letter using Spellbinders Circle Dies, then cut the larger circle making sure to punch from the same area as the small one, so when I lined the images up they would flow nicely. I stamped the sentiment from Stampin' Up! 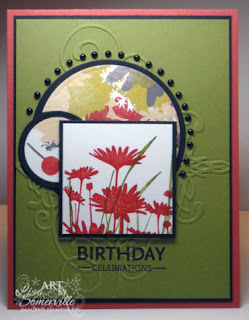 's Upsy Daisy in Black on Olive card stock, then embossed my panel using the CuttleBug Flourish folder. For the focal panel, I stamped Stampin' Up! 's Inspired by Nature in Old Olive, then stamped the flowers from Upsy Daisy in Ruby Red. Thanks so much for stopping by! I'll be back tomorrow with my Kitchen Sink Stamps Monday Post - tomorrow also marks a new monthly challenge in the Kitchen! Lisa, your card is AWESOME. I love all the details, that embossing folder is excellent. Your brads are just amazing. A very beautiful card! Gorgeous card, I love the image you chose with the papers. Great job on the sketch this week! Just beautiful! I love those black pearls. You rocked this sketch, awesome job. Love all the little extras. Thanks for playing along! Yikes, how did I miss this one? Lovin' the layout and the colors are amazing!